Sadly, living in central London means there aren’t any Tesco stores large enough near me to stock Vivo – ever since it first launched I’ve been seeing blogs with lust-worthy, bargain products on. Slightly ironic since I grew up somewhere where Tesco was a short walk or drive away, didn’t really think about it then – now I wish I had one on my doorstep again! Anyway, odd supermarket thoughts aside – here’s a few pics and swatches of this lovely little baked shadow and blusher compact from Vivo. First up, I love how these little domed pans look like little planets – very cute. I think the combination of colours is quite unusual, it’s a real rainbow of shades. Each of the colours are packed with shimmer – for the blush this gives a gorgeous glow (I adore this colour). The most wearable eyeshadow shade has to be the black I’d say or possibly the pink. The blue is very cool toned and frosty, I’m not sure how I would add this into a look as I prefer warmer shades. The mint green is very pretty – but like the blue, I’d need to look up some inspiration on how to use this, maybe with a champagne gold colour?? My favourite product in the palette is the gorgeous glowy blush – I’ve been using this a lot as I love the warm peachy-pink shade with a glowy shimmer – but not glitter. The fact that all these shades are shimmer but not glitter is a major bonus, normally cheaper shadows seem to be packed out with glitter instead of the finer milled pigments. Have you managed to stick any Vivo in your shopping trolley when stocking up on other ‘essentials’?! What do you think of the range?? 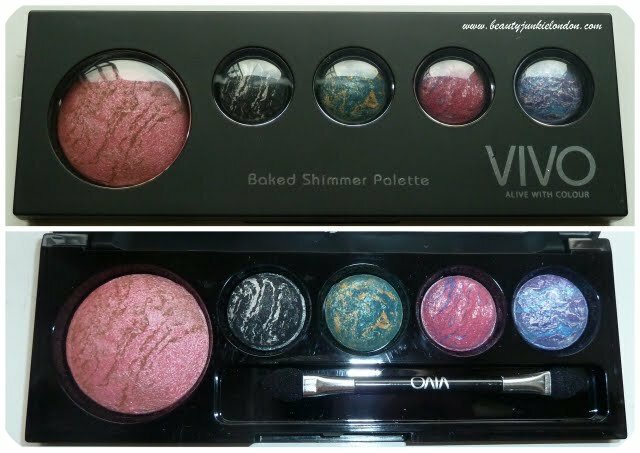 Vivo is available from Tesco, the palette is priced £6 (bargain). Previous Post Jurlique Joy of Giving plus WIN! I have had a few samples for my blog, but other than that, the biggest Tesco near me didn’t stock it, so I couldn’t grab other goodies 🙁 It’s a shame that they are not more widely spread as they truly are good quality, and the price tag is good as well! I have the Chocolate Box palette, which I did a post on, I use regularly and its a bragain for the quality. Very pleased. I have heard from Vivo themsselves they are going online very soon, which is great as there’s no Tesco near me! We haven’t got a VIVO near us either but been sent a couple of bits and pieces. Totally LOVE all of their baked products they’re lush!